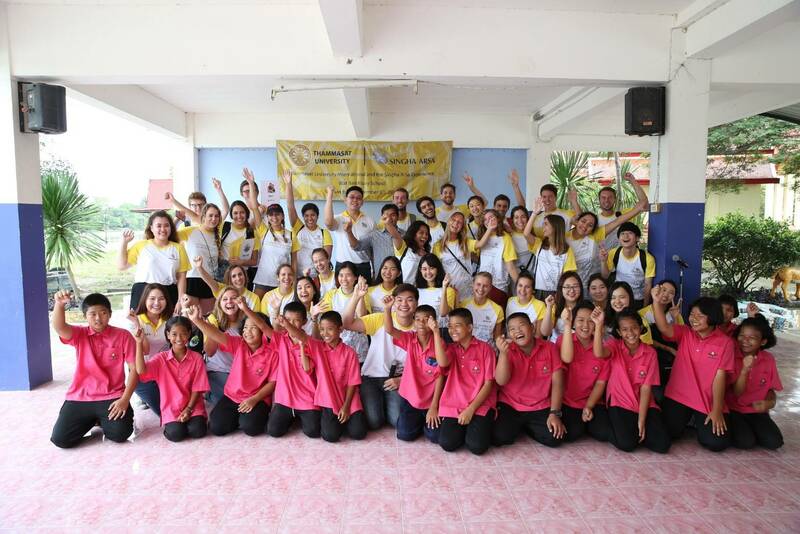 23 March 2019 – Office of International Affairs, Thammasat University in corporation with Boon Rawd Brewery Co., Ltd., took 13 International students to join Singha R – Sa Project for social responsibility activities with students at Baan Nong Klang School, Nakhon Pathom Province. Singha R – Sa is a network of volunteers both locally and overseas, whose members vary in terms of age and professions. The dedicated volunteers are ready to help people. The networks has a strong and enthusiastic management team and supported by well- known organizations both domestic and international as a “World well-known Thai Volunteer group”. Singha R – Sa strives to make our world a better place with human right awareness. International students joined social responsibility activities, including English class and playground painting. Moreover, the international students also joined the related activities there, such as Thai dessert cooking and playing football with students at Baan Nong Klang School. International students reflect that the event was impressive and hope to participate in activities like this again in the future.